Alma Galván, MHC is a Senior Program Manager with MCN. 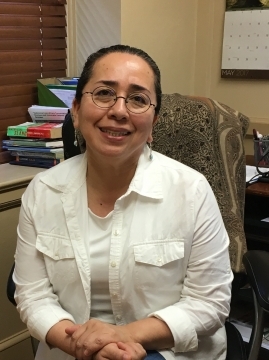 Bicultural and bilingual, Ms. Galván has dedicated decades of work toward the health needs of border residents in Ciudad Juárez/El Paso, focusing on a wide range of public and environmental health issues including drug prevention, cultural competency, and water and sanitation concerns. She has collaborated with MCN regularly since 1999, including on our community health worker training guides and our popular pesticide comic book Poco Veneno...¿No Mata? Ms. Galván has a Master’s Degree in Health and Communication, and has expertise in community development, technical assistance, and assessment of training programs and curricula. She has been an international leader in the use community health worker/promotores de salud to impact the health of vulnerable populations. She has also devoted her efforts to address the needs of indigenous communities along the border. She comes to MCN from her longtime role as a consultant with the Panamerican Health Organization. A new resident of Maryland, Ms. Galván is thrilled to be closer to many of her nieces and nephews, who primarily live along the East Coast.